We roam around the china town to find the special cuisine that is quite new to our ideal of eating siopao, this is not a normal siopao that has been steamed but this is fried. Yah you got it right! This is fried siopao! I know you wonder how it was made and what it taste like. The meat and the sauce inside is not the normal flavor of a siopao, it’s texture is not dry because it has sauce on it. The bottom of the siopao is kind of crispy. When you bite its very good! When you visit China town you must buy and try this wonderful and nice Fried siopao. This is a great experience to everyone. Next is the Noodles with beef balls! A very remembering and wonderful dish, it maybe look simple but it taste good that cost only around 145-155 pesos, this dish is good for 2 people. A salty soup with noodle and vegetable on it, with beef balls on top. The beef balls is awesome it taste very nice, honestly it doesn’t look like it’s delicious but once you’ve try this, you will realize that your wrong, it taste very good, that you will enjoy with soy sauce and chili garlic. Happy eating! This is the Special Kiamoy! A Chinese candy. Probably it is made of dried plums coated with sugar. This picture is a flavored kiamoy. 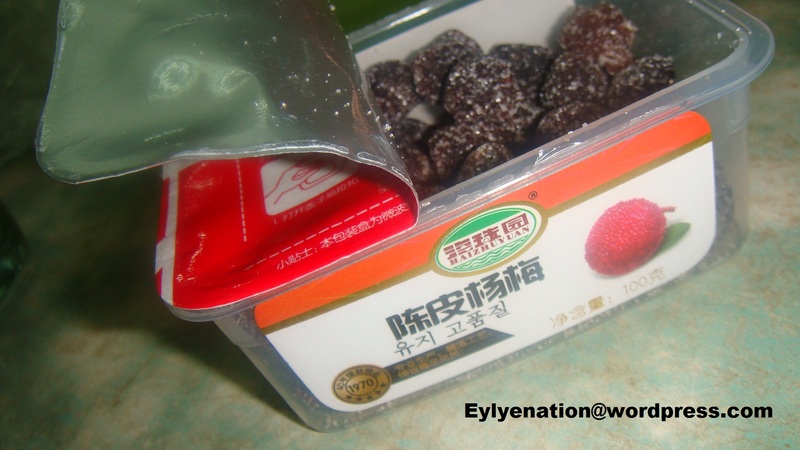 We bought it in a Chinese groceries store along the street of ongpin. The taste is quite different but it is good.” Pang-tangal umay ba”. We eat this while we are walking along the Ongpin St. When you pass through the street you will see many authentic foods like lumpiang Sariwa, Tikoy, Hopia, and siomai. Trivia : when you buy siomai in China town many restaurants will serve it with soup. The siomai swims along the soup. And when you want to buy kiamoy, get the large pack than the small one, it’s more ideal to buy the large one when you are in a group. 😀 just enjoy shopping when you go to China Town!